Claydon will be extending its range of hydraulically-folding Claydon Rolls at LAMMA (Hall 6 - Stand 651) with the launch of a new 6.3m version. The range will be further expanded later in the year with the addition of an 8.3m unit. The introduction of these two new models follows the success of the 12.3m Claydon Roll, which was seen for the first time at CEREALS 2013. Folding horizontally to less than 2.85m wide for road transport, the unit incorporates five 2.5m-wide sections and weighs 8400kg, generating 682kg of pressure per metre of width. The Claydon load transfer system ensures that the rolls deliver uniform consolidation across the entire working width of the machine. Equipped with 600mm-diameter breaker rings mounted on a 60mm shaft, the unit accurately follows the ground contours and consolidates down in the seeding rows, creating an uncompromised finish. Requiring no more than a 120hp tractor, the 12.3m Claydon Roll will achieve an output of 6.63ha per hour at a forward speed of 6kph and is ideally suited to 24m tramlines. Weighing 4500kg, the new 6.3m wide, three-section Claydon Roll delivers a pressure of 715kg per metre evenly across the full working width and also folds down to 2.85m wide for transport. With a low centre of gravity and excellent visibility, Claydon Rolls are safe and stress-free to manoeuvre when travelling between fields, while hydraulic brakes, mud guards and light boards are fitted as standard. In the field, they can be quickly and easily be set up for work, without the operator needing to leave the tractor seat, while a stone box is standard for added convenience. “Achieving thorough consolidation around the seeding zone is a key factor in achieving effective crop establishment,” states Spencer Claydon, Sales Director of Claydon Drills. Claydon Rolls are the latest development of the Claydon System. 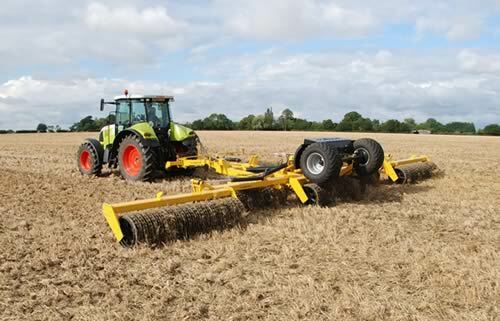 The Claydon Drill’s patented seeding technique allows farmers to establish many different types of crops direct into stubble, min-tilled or fully-cultivated soils. Now used all over the world, the system has become the most sustainable one-pass seeding technique in Europe and can be used year-on-year to attain above-average yields, avoiding unnecessary and expensive pre-cultivations. The cost of establishing crops with the Claydon system is approximately one-third that of using a full cultivations programme and half that of conventional minimum tillage. A further significant benefit is that the Claydon drill’s simple, yet effective two-tine system encourages very deep, complex rooting structures to develop, which leads to stronger, healthier crops with improved yield prospects. With minimal moving and wearing parts, Claydon drills also provide easy, low-cost operation and servicing.